There is probably no better combination than good music and a fabulous day in the mountains. 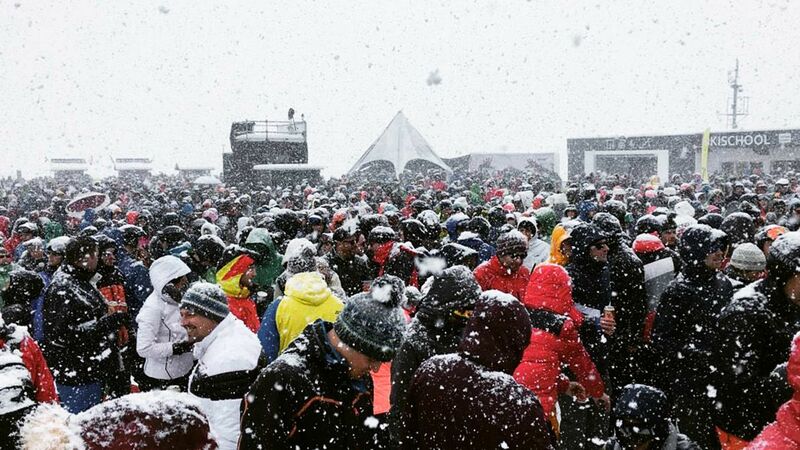 Well, on top of the Electric Mountain Festival 2019, Sölden offered some amazing spring powder ski runs this year, before heading to the dance floor. It’s Thursday morning, it’s raining in the valley of Sölden. However, there seems to be a pulsating motivation at the bottom station of the cable car. As the cabin moves towards the top station the rain turns into snow and even thought the visibility is a bit tricky, it seems like there is a great powder ski day ahead. If this would not already be amazing enough, especially considering it is April already, the Electric Mountain Festival 2019 is taking place, starting with the warm-up at 13.30h and heading into full party mode with world-famous DJs and a crowd of motivated music fans. The best thing, you can enter the party without buying an extra ticket, all you need is a valid ski pass for the day. Of course, also pedestrians can join the festival with an up-and-down ticket for a reduced rate. As we finish our skiing day with a nice lunch at one of the fantastic mountain huts of Sölden, we move towards the Giggijoch, located at 2.200 m and can already hear the beats from far up the mountain. Led by the sound we reach the “Funzone” with a huge stage, including a LED-wall with an area of approximately 40 m2. It’s big, it’s loud, it’s party time! It starts with some warming-up beats and various DJs, before the main act of the day, Robin Schulz, enters the stage. Now also the last people standing around start to move, while the snow keeps falling on our heads. The party goes on until the last gondola leaves the mountain at 19.30h and the happy party crowd slowly moves to the valley again. Nothing else to say than this was amazing! Powder, good vibes, great people and a location that is breath-taking. In the end, all our clothes are wet from the snow, possibly also from the dancing but it doesn’t matter, it was a day for the books for sure! You will have to experience it in order to feel it and maybe next year we will meet you at the Electric Mountain Festival 2020 in Sölden, Austria for some skiing and dancing from another world! 16/04/2019 Last weeks of the ski season. Nature on a different page.